A volcanic explosion in northern Death Valley occurred 800 years ago, not 6,000, “far more recently than generally thought,” according to new dating estimates. The event that created Ubehebe Crater is so recent, in fact, geologists think another devastating explosion could happen today. “This certainly adds another dimension to what we tell the public,” a park ranger said after hearing the announcement reported on Science Daily. Using isotopic ages on rocks blown out of the crater, geologists from Columbia University calculated dates from 2,100 to 800 years old from the debris, with the biggest explosion at 800 years ago perhaps being the grand finale of a series of eruptions. The article said some of the other pits in the vicinity, called maars, gave dates of 3,000 to 5,000 years. Explosion pits like Ubehebe (pronounced you-be-hee-bee) are thought to result from groundwater hitting a magma pocket. It seems surprising to envision water in this hottest, driest part of North America, but if the explosion occurred in the middle ages (around 1200 A.D.), tree ring evidence shows it was even hotter and drier then. If explosions occur periodically every thousand years or less, it’s not out of the question another one is coming. Study coauthor Brent Goehring, (now at Purdue University) says this would have created an atom-bomb-like mushroom cloud that collapsed on itself in a donut shape, then rushed outward along the ground at some 200 miles an hour, while rocks hailed down. Any creature within two miles or more would be fatally thrown, suffocated, burned and bombarded, though not necessarily in that order. “It would be fun to witness — but I’d want to be 10 miles away,” said Goehring of the explosion. 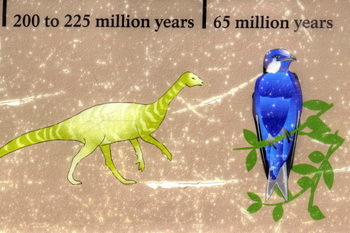 In all fairness, the write-up on Live Science pegs the earlier estimate at 4,000 years. That would make the earlier geologists only 500% wrong. When you go to national parks, do you accept the interpretive signs as authoritative? There have been other examples of misinformation, some even worse – like the realization in the 1980s after Mt. St. Helens erupted that the Yellowstone fossil forests must not have grown in place (as long taught by park sings), but were buried quickly by catastrophic volcanic mudflows. Scientists don’t know when Ubehebe erupted. Even the revised date is based on indirect evidence that might be overturned again. *Since there is no such word, we will assign it the temporary meaning of gullible for present pun-itive purposes.